Florida Museum of Natural History researchers used a series of 130-foot cores drilled from the Po Plain in northeastern Italy to test a thought experiment: Imagine catastrophe strikes the Adriatic Sea, swiftly wiping out modern marine life. Could this hypothetical mass extinction be reconstructed correctly from mollusks—hard-shelled animals such as oysters and mussels—preserved in these cores? When they examined the cores, the results were "somewhat unnerving," said Michal Kowalewski, Thompson Chair of Invertebrate Paleontology and the study's principal investigator. Paleontologists use the age of a species' last-known fossil to estimate the timing of extinction. 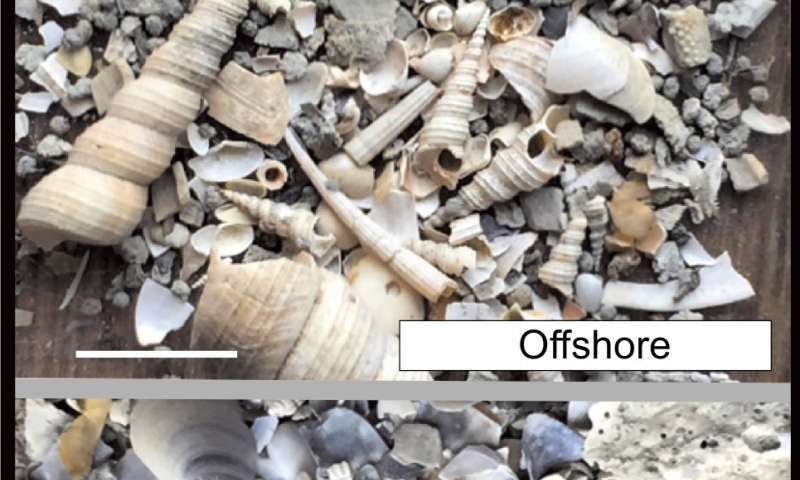 A sudden extinction in the Adriatic Sea today should leave the youngest remains of many mollusk species in the sediments currently forming on the shore and seabed, the "ground zero" of the hypothetical extinction event. But the team found only six of 119 mollusk species—all of which are still alive in the area—at the top of the cores. Instead, the last fossil examples of many of these species often appeared in clusters dotted throughout the cores, suggesting smaller bursts of extinctions over a longer timeline, not a single massive die-off. "We're not saying you cannot study mass extinctions. You can," Kowalewski said. "What we're saying is that the nature of the geological record is complicated, so it is not trivial to decipher it correctly." The results of their analysis did not come as a complete surprise. Computer models designed by paleontologists Steven Holland and Mark Patzkowsky had made similar predictions about how the final resting place of fossils—influenced by species' ecological preferences, sea level and the makeup of sedimentary basins—could skew patterns of mass extinction. "This is, to my knowledge, the first empirical study to use the fossil record of living species to test these models rigorously and computationally, rather than theoretically," Kowalewski said. "We know these species are still living in the Adriatic Sea, so we can be sure that their disappearance from the fossil record does not represent a true extinction." Applied on a larger scale, the Signor-Lipps effect can make abrupt mass extinctions appear gradual. A common approach to correct for this effect is to assume that where fossils end up—and are later discovered—is random, and mathematically adjust estimates of extinction timing accordingly. But it's more complicated than that, Kowalewski said, because the fossil record is not created in a random way. Climatic cycles trigger changes in sea level, causing shorelines to advance or recede and driving changes in environments. A beach may become a mudflat, for example, or a delta can turn into a coastal plain. 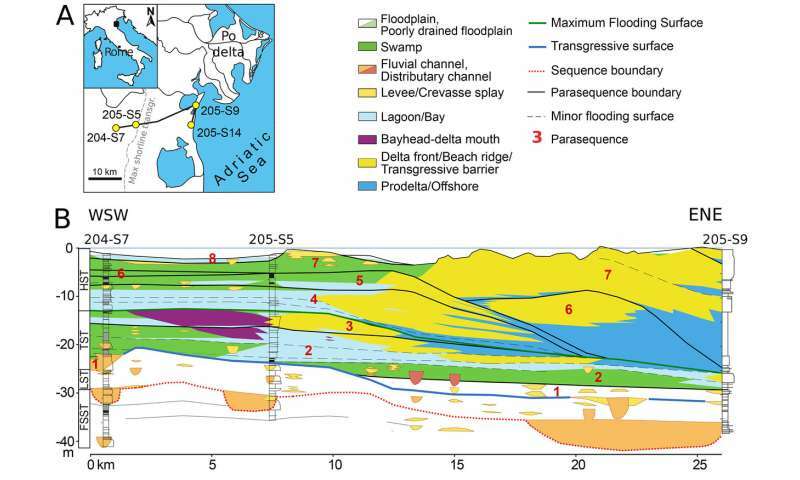 Shifts in sea level can also affect sedimentation rates—how quickly mud and sand are deposited. These factors can cause last occurrences of fossils to cluster together and influence the probability of finding fossils in a given location. When the researchers reordered the species represented in the cores from the Po basin according to their last occurrence, they noted several points at which many species appeared to vanish simultaneously. In reality, none of the species had gone extinct. They disappeared from a given site either because local environmental conditions changed, or they were simply missed during the sampling, said Rafal Nawrot, the study's first author and a postdoctoral researcher in invertebrate paleontology at the Florida Museum. The cores also depicted a false pattern of extinction, with the majority of offshore species disappearing in a single large "pulse" in the lower part of the cores and shallow-water and brackish species fading out in several smaller pulses. This is because species followed their preferred habitats as they shifted with changing sea levels. Deeper-water dwellers vanished first, as the local river delta started to expand into the Adriatic Sea, replacing open sea with coastal conditions. When shorelines advanced even farther, shallow-water species disappeared as well. "It's important to admit that fossil species—just like modern ones—have specific ecological requirements, which sounds obvious but is not always acknowledged," Nawrot said. "If you apply methods based on the assumption of random fossilization, you get a precise estimate, but it may be wrong by millions of years," Nawrot said. "Not only the pattern of extinction but also the timing of extinction would be wrongly interpreted, so this is quite important." While the findings are sobering, the situation is far from hopeless, Kowalewski said. When the team incorporated methods that accounted for species' ecological preferences, distribution and abundance into the analysis, the results were a much closer approximation of what exists in the basin today. "This provides us with an initial guideline of how to analyze these types of data to get a more realistic assessment of extinction events," Kowalewski said. "Certainly, this is a work in progress." Yeah, an earthquake or other energetic event would liquefy soil. Heavier items, heavier remains would sink deeper than lighter remains. Then continue to repeat these tectonic level events. Tens of thousands of times over tens of millions of years. A gullywasher storm rips open a channel and the flow can carry the less massive debris pretty far. Afterwards it is as if the materials were deliberately sorted. When it was water pressure and gravity blindly filtering the debris.